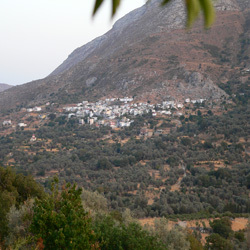 Built on the south, and at the centre of Rethimnis county, with a distance of 35 km from the capital, at the foot hills of the Siderota mountains on the one side, at a height of 525 meters and the towering over of the mountainous growth of Kedrous on the opposite side, Akoumia plays a significant role of Lampis township, province of Ag. Vassiliou, and were a community from 1925. In accordance with the latest count, the total population amounts to 628 residents, together with Vrises and, the acknowledged as the built-up area of Triopetra. The establishment of the village dates back to the peak of the Byzantine empire, around 1000 a.c., and, to be more precise, when Nikiforos Fokas freed Crete from the Arabs and had Christian families settled there in order to reinforce the population, a fact that is proved by the wall paintings of Christ (the church of the metamorphosis of the savoir) which date back to the 10th – 11th century. The name generates from the corrupt interpretation of the word “Komninos” of the great Byzantine family, the parents of who were transferred to Crete, or from another aspect, the founder was named “Koumis” according to the Byzantine scientist Nicolao Papadiki, of Vrises. The third interpretation of the word Koumi = Koumos = small temporary settlement – Koumia – the Akoumia. Par excellence, farmland area with its occupants divided between civil settlers and the boorish settlers of France. Their occupation with agriculture and cattle breeding helped shape the once closed financial community with limited resources made the survival difficult under unfavourable circumstances. This is maybe why the written word was so appreciated, and why this transformation that gave the younger generation the chance to improve their quality of life, this also explains the large number of educated people but also – internally mostly – migrates. A homogeneous and small in number community, is self sufficient, with a rich folk tradition, which originated from their daily needs, this shows certain folklore, of interest to the researcher. Autarchic and hierarchy community with rigid beliefs and religious rules, with a solidarity between its inhabitants and understanding of important matters – which might in fact be the reason for the low crime rate – this gives reference to the mutual religious life which also determines the social life and is reflected by the central church of the Virgin Mary, which is located in the square and acts as a landmark, with the homonym festival. Their presence in ancient battles was continuous, as much in the Cretan revolution, with the historically witnessed participation of Captain Anagnosti Marinaki, to the reunion of captains beneath the planes of the Balkan wars, but also in the campaign of the Near East, till the Occupation. Today, demographically shrunk, the community survives steadily with improved living conditions, and with intense activity, mainly during the summer months, where the local community gathers for the festival of August 15th, and the lively movement at the beach emphasises its presence, and gives them a new face that combines tradition with the contemporary way of life.